Who else is surprised I watched ANOTHER SUPERHERO MOVIE? (Anyone?!) This is a film I've been eagerly waiting to see for a while. It might be due to the star cast, the humour or the fact this character was previously portrayed before to less than stellar results. Either way, this was a must for my friends and I. The movie I will be reviewing today is the less than serious (and proud of it!) superhero flick: Deadpool. 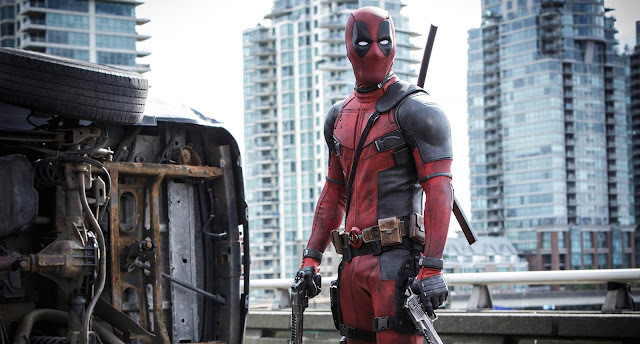 The Plot: Wade (Ryan Reynolds), a no nonsense gun for hire, is transformed into the crime-fighting mercenary Deadpool by a mysterious organization. After escaping the facility and years of tortured, Deadpool goes on a mission to hunt down everyone who might've been the cause for his pain and transformation. To sum up everything: I loved Deadpool. It was fun, witty, cheeky, and completely self-aware about how ridiculous the movie is. It pokes fun at itself as well as the audience who is watching it. The fight scenes are excellently choreographed, the dialogue isn't too self-serving and the characters feel like real (and despicable) people. Ryan Reynolds works as the titular role and it's a great move that he returned to done the suit again after the terrible version used in the Wolverine movie. Deadpool is Ryan Reynolds and vice versa - they're a perfect mix and that's one of the reasons Deadpool the movie works as a whole. If you like superhero action movies or simply a funny popcorn movie to watch right now in theatres, Deadpool is the one you should see. I already can't wait for the sequel; let's hope they don't mess with success by going too far off course.